Pop quiz: When is a $656 million lottery jackpot not a $656 million lottery jackpot? Answer: When Uncle Sam gets his hands on it. And according to the results of a recent poll conducted by the Hoover Institution, Americans aren't amused at the numbers game. Last month the nationwide "Mega Millions" lottery named three winners in its record-busting jackpot, supposedly worth nearly two-thirds of a billion dollars. The true number of the payout (while still substantial) was a whole lot smaller than that. Let's start with the headline figure: $656 million. In fact, claiming the full dollar amount requires a lottery winner to receive the winnings as an annuity, doled out in drips and drabs over many years. Unsurprisingly, many people who get "lucked by lightning" and win the big prize instead grab the cash and run, lest the Fates discover their mistake and try to take it back. Electing to take a lump sum payout, however, lops about 28% off the size of the prize, reducing it to $474 million. Then there's the issue of multiple winners. Three winning tickets were sold in the most recent Mega Millions drawing, with the result that winners had to split the prize three ways. On a lump sum payout, that works out to $158 million apiece. Still a lot of moola, you say? Well, wait just one second, because there's another hand that wants to dip into the till -- and it's taking the biggest cut yet. According to the taxman, lottery winnings are taxable as ordinary income. At the 35% income bracket (that any multi-million-dollar winner instantly falls into upon winning), this works out to roughly $55 million going right back to the government in the form of income tax. 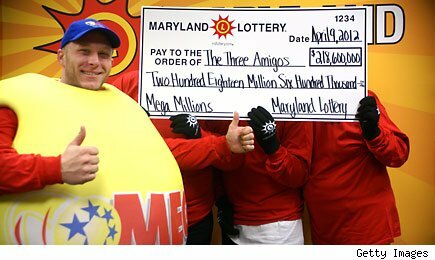 When all is said and done, this month's $656 million prize wound up being "mega" in name only for its three winners, who took home barely $100 million apiece. Of course, anyone would gladly take the $100 million left over after Uncle Sam takes his dole. Still, seeing a prize billed at "$656 million" whittled away, practically overnight, to a mere $100 million strikes some taxpayers as wrong. According to a recent poll conducted by professor Brian Gaines of the University of Illinois and professor Douglas Rivers of Stanford, the average American believes lottery winners shouldn't have to give back more than about 10% of their winnings to the government -- and, in any case, not more than 15%. Most voters, it turns out, think it's downright unfair to give a person a once-in-a-lifetime windfall, only to claw back more than a third of the wealth before anyone's had a chance to enjoy it. Now, if this sounds like an argument against taxing millionaires and the "Buffett rule," it probably is, in part. After all, the Hoover Institution is pretty widely known to be a bastion of conservative thought. But there's another angle to this data, too. By Hoover's own admission, most Americans support raising taxes on people who earn more than $250,000 a year. In fact, 62% of voters polled support passing the so-called "Buffett rule," requiring at least a 30% tax on "millionaires." But why the disconnect? Why do the same people who want to shave 30% off the paychecks of those who earn one million dollars balk at the idea of charging more than 15% to folks who scored a $656 million, $158 million, or $100 million payday? Perhaps it's because to many people, the idea of having $1 million in their bank account -- much less $100 million or more -- seems very unlikely. "It's never going to happen to me," they think, "or to anyone I know." And as the saying goes: "Don't tax you, don't tax me, tax that guy behind the tree." But here's the thing: Statistics prove that you're many times more likely to earn $1 million than to win it through a lottery. According to CNN, in tax year 2010 alone, the U.S. produced no fewer than 80,000 new "multi-millionaires." We minted 600,000 new garden-variety millionaires that year and 800,000 half-millionaires -- most by dint of hard work and diligent saving. Believe it or not, what these figures mean is that while you may have only a 1-in-176 million chance of ever winning a Mega Millions jackpot, your chances of becoming a millionaire in your lifetime are pretty realistic -- one in 526. Set your sights on the more modest goal of saving only $500,000, and your odds rise to one in 385. Indeed, aim a little higher, work a little harder, and start investing a little sooner, and one out of every 3,846 of you can become a real multi-millionaire.